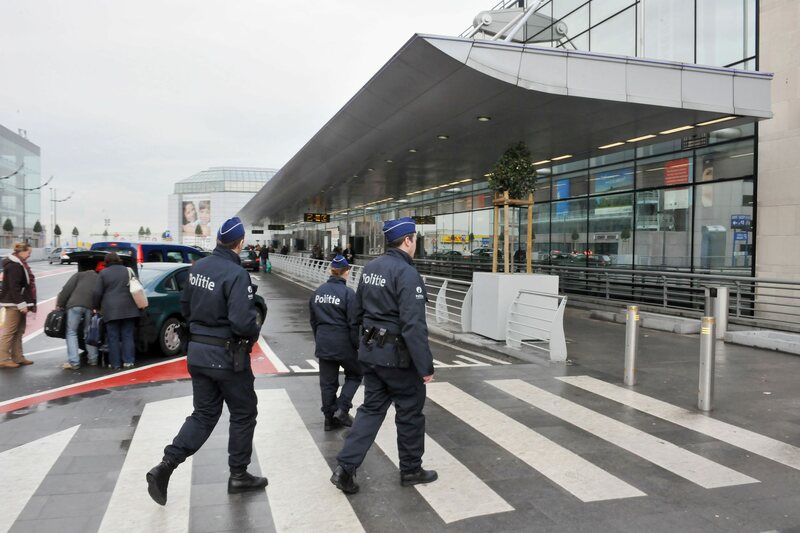 Around 8 a.m. local time, two explosions blasted through Brussels Airport in Belgium, putting a country already beleaguered by a rising wave of homegrown terrorism on high alert. The blasts blew through the airport's departure hall, and video posted online shortly after showed smoke rising from the building. Update: A series of coordinated blasts in Belgium, two at the city's key airport and another at a busy subway station, are thought to be terrorist attacks. At least 25 people are believed to have been killed. At least one person is reported dead with many more injured, according to local media. RTBF reports that up to 10 people were killed and dozens more wounded. The airport is in lockdown, and passengers are being evacuated to the tarmac. All flights have been canceled, and air traffic is being diverted. The airport has warned everyone to stay away from the area. Roughly two hours after the original explosions, another blast was reported at the Maelbeek metro station in downtown Brussels, which is near several EU buildings. Brussels' entire metro system is shutting down with all stations closing. Sky News reports that shots were fired in the airport before the explosions detonated. Authorities have yet to confirm that report. The country's terrorism level has been placed at its max in the wake of the blasts. It was not immediately clear whether they were the result of a terrorist attack, but Belgium has become an epicenter of terrorism activities in recent months. Just last week, one of the suspects in last November's Paris attacks, Salah Abdeslam, was arrested after months of eluding authorities. No group has claimed responsibility as of an hour after the explosions. The U.S. Embassy in Brussels advised citizens abroad to "be aware of local events, follow local authority instructions, monitor local media further developments, and take the appropriate steps to bolster your personal security." Belgian authorities are telling people to stay where they are and to avoid making phone calls and post on social media and messaging apps to communicate with loved ones instead. The emergency phone line is (+32) 02 506 47 11.